Where can you go for some substance after a long night on the steamy South Beach scene? 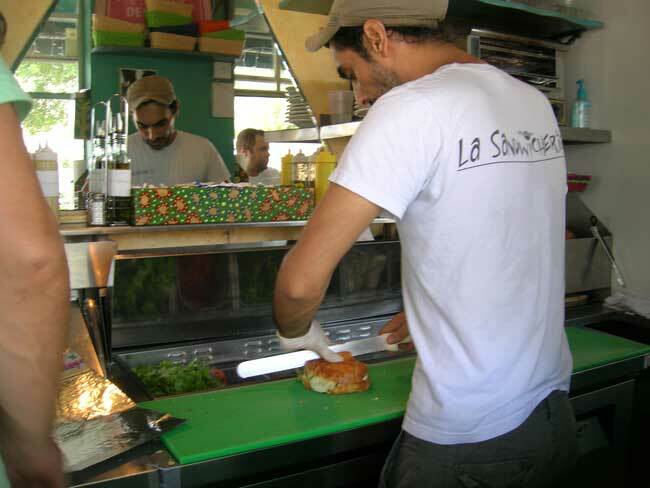 You head over to La Sandwicherie, that’s what you do. This outdoor café has been serving up French-style subs and salads for 23 years, staying open as late (or early) as 6 a.m. These sandwiches, made with gourmet deli meats and cheeses, are bountiful and delicious. Try the popular Prosciutto & Fresh Mozzarella ($8.95) on your choice of French bread, wheat, or a croissant ($.85 extra). The French Salami with Camembert cheese ($7.85) is delightful, featuring this soft type of cheese similar in texture to Brie. You can also request your sandwich toasted. Fresh, fresh, fresh! During our short visit, we watched the staff behind the hand-painted counter refill the toppings buffet at least twice. 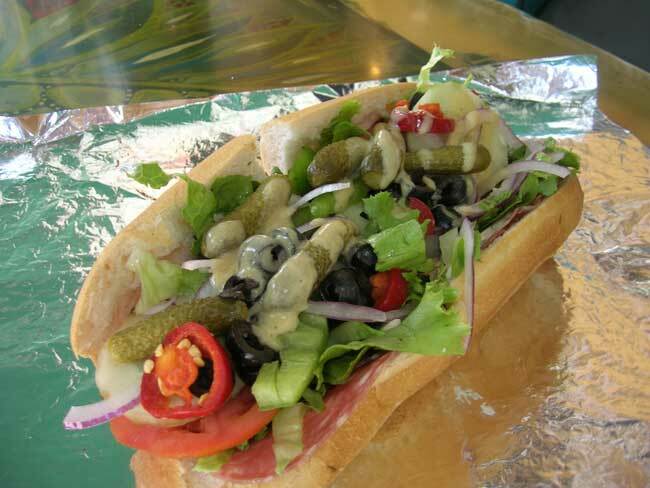 Your choices include lettuce, tomato, green and hot peppers, black olives, onions, cucumbers, Cornichons (French pickles), mayo, and French vinaigrette dressing, at no additional cost. 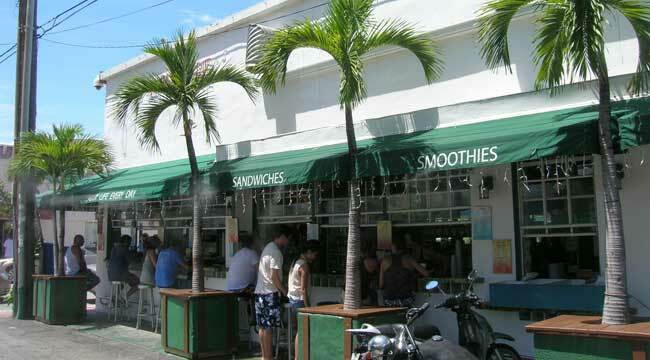 Located off Washington Ave. and 14 St., La Sanwicherie is just a few blocks away from the ocean. It’s also a perfect pit stop on the way to a day at the beach. 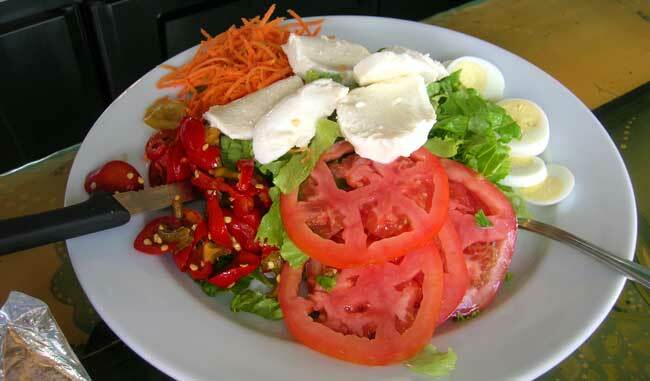 If you’re in a hurry to soak in the sun, take it to go for a simple and satisfying lunch for around $10. For a taste of La Sandwicherie without the carbs, try a crisp salad, Antipasto, or cheese plate ($6 – $7.90), available with toppings as well. 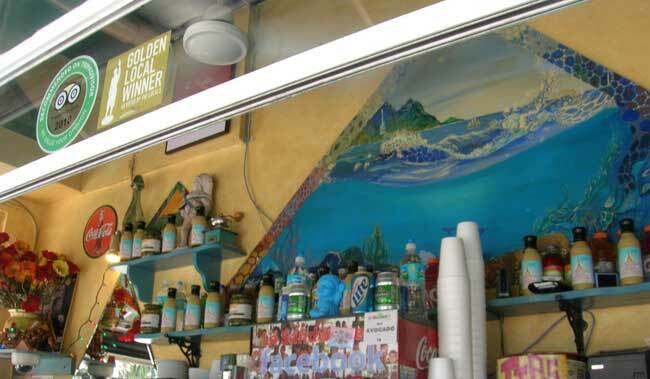 They also offer a variety of fruit smoothies, shakes and veggie juices ($4.60 – $5.20). We went with the Bora Bora, a tall serving of sunshine made with mango, banana, pineapple, and orange. 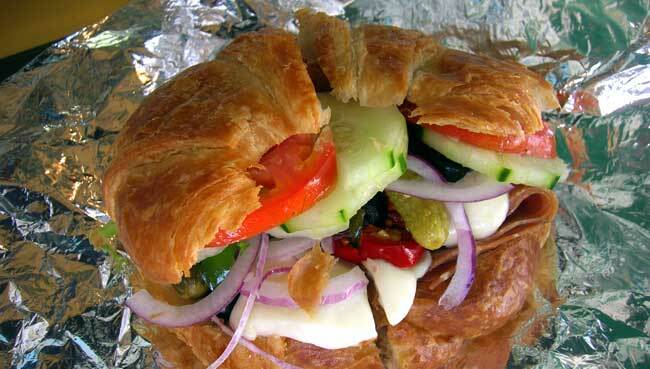 Take a trip to this little corner of sandwich heaven. And while you’re there, tell them you heard about them on GreatFoodList.com. If you’re lucky, they snap your picture and post it on their Facebook page. Sunday through Friday, 8 a.m. to 5 a.m.
Friday & Saturday, 8 a.m. to 6 a.m.
Take-out available. Delivery from 9:30 a.m. to 10 p.m.